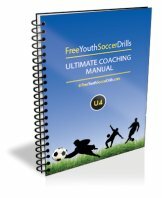 Soccer coaching drills for U8 - U9 age groups! Now go check out the U8 - U9 drills above and see what you can take to your practices and sessions. If you feel the U8 - U9 drills are too sophisticated for your players then take a look at the great drills under the U6 - U7 tab on the left hand side. Alternatively, if your players are becoming too advanced for these drills then the U10 - U12 drills or even U13+ drills might give you some fresh ideas. Happy hunting!